Login to your blog / site and go to your dashboard. In the dashboard’s menu, click on Pie Register > Settings > Security. 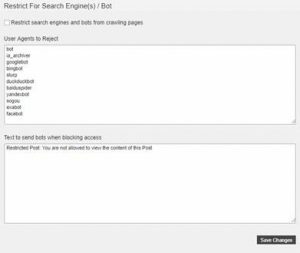 Restrict search engines and bots from crawling page content. In Basic sub tab, scroll down to Restrict Search Engines and Bots from crawling website content. Click to enable Restrict search engines and bots from crawling page content. Enter Text to send bots when blocking access.